Android and Windows… can communicate over a Wifi connection but, in order to get something out of it, some application has to be listening on the Windows platform, and this is what1 brings me2 here. This Tabs introduction… should clarify the idea, with the help of a growing list of screenshots1 and some samples showing how they are your own custom components2 in this app and an example3 showing what they are made of. Some definitions… to put names on the different pieces like Tabs & Tags1 SHELL 2, SENDKEYS3, SENDINPUT4, the list of SERVER commands5 # comments6, APP commands7 and some practical illustrations, will explain all the details. 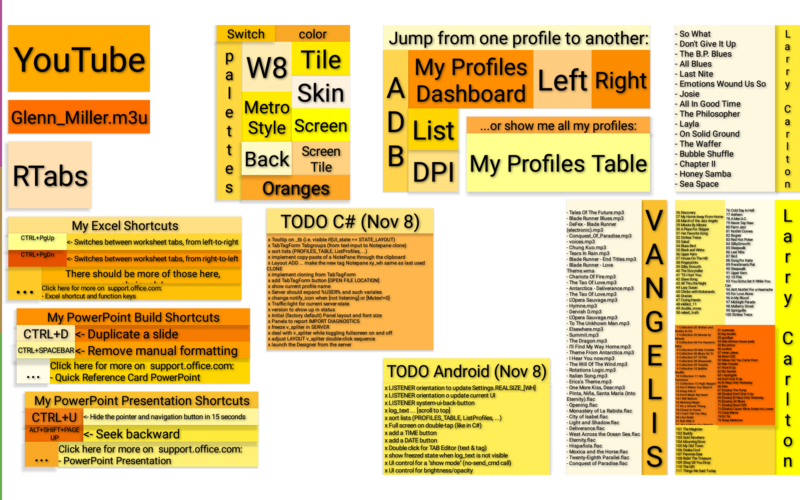 The Designer… is a Tab Editor1 used to create Custom profiles2 and an intersting Todo list3. Google Play Store does not support any free test period for paid apps, but at this stage, you can get a free Test version1 from this site. Here is how to Download and Install2 the Android Client APK and the Windows Designer and Server zip archive. 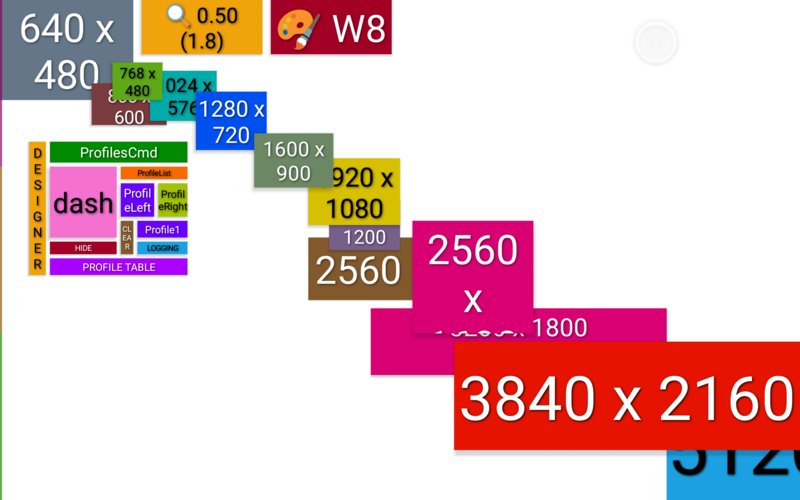 This app goals are rather straightforward: If we can communicate with Windows using a mouse or a keyboard, it seems obvious we should be able to design a more sophisticated interaction scheme with android smartphones and tablets. The results was a small list of handy mouse, keyboard or remote-desktop utilities. The "make it happen" utopia greeting came to mind, again, but this time, I was ready to give it a real try and here I am, four months later. As Windows can be controlled through Remote Destop utilities, creating a server application that would relay some commands through a Wifi connection won't require any magic in it. SHELL .. to launch the default command associated to file with extensions: txt, mp3, avi, …etc. No luck! Curiously, the subject has not been addressed yet, unless I missed it completely each of the many times I searched the store. If I put this here, it's because it's always good to know who is talking. The same words can have more meaning when you know where they come from. Any bragging aside, I bring all my experience into this project in order to accomplish something worth more than the average android app. And I've seen a few already showing that android has all we need to step forward. I'm talking about 35 years of passionate work since the dawn of Unix, K&R, Workstations, Smalltalk. I was working for Tektronix at the time… I'll stop here about the details as this is enough for those who know what I'm saying and already too much for those who don't. You don't do things the same way with last gen development tools that won't let you wander around with your fancy ideas as long as they are designed to make sure you don't. Well, I'm still using vim. All I ask Visual Studio, Android Studio, etc. is to feed the compilers with my stuff an add their distribution trimming because they are good at this. And when I'm done, I still can get back to the main road looking for Google Play Store. Essentially, when I think about what a button (a.k.a. RTab) should offer in the three applications involved here, it's more about the intent of the user rather than the process involved. It's all about who is driving computers, users in front of it or processes and their code behind, you choose, well …if it's an option! I will take care of the back-end part myself but I need to get enough feedback from users to make sure I won't miss some good idea you may have. The goal is to get the more of what we can expect from all our gadgets. The 4 first screenshot images above come from an android tablet. They are only a few examples of what can be done at the moment. Some tabs contain a single word (or letter as in the logo), others an entire list of lines. Both are the same kind of dynamic software object to be designed by the user. None of them are coded. Only a dozen controls come from a standard set of tools on the Windows .Net platform, in the designer and the server. I won't get into more details at the moment as this is only to get an idea of how easy it is to do the user part of the design, even without a designer. Some syntax rules to swallow and that's it. Of course, those can be packed in a simple text file or embed in an email to cut and paste. Here are some examples of the different kinds of tabs and a few of the commands we can assoctiate to them. Tab is the name I just gave to my buttons, nothing fancy, no semantics to get into about it. Tag on the other hand has somewhat more meaning, it is commonly used as an anchor point where something can be attached to a sofware item, whatever they can be. Both the tag and the item can be what we want them to be, how handy is that! Here, the tag property contains the associated command like tag=SHELL …, tag=RUN … or tag=SENDINPUT … while the text=YouTube property is what will be displayed. A simple web address, like Youtube or some web page for your browser. that knows what to do with it. This type of buttons send some keyboard events (text from some specialized cheat-sheet for example) related to specific applications. As with SENDKEYS, buttons with the tag=SENDINPUT ... send keyboard events but those are received at the rate expected from a hardware keyboard. The software of this RTabsServer module comes from a DX1-Ergodex driver I had to rebuild a few years ago. Although these events have an 'artificial signature', games have no way to make the difference with a hardware device sending some macro sequence as there is none. I could experience a quite different results with a use-case on The Elder Srolls Online and Star Wars, The OLd Republic. As ESO was ready to play along with Sendkeys generated Virtual keyboard events, SWTOR did not catch its Slash-command trigger (the first slash character) for the most part. Once the SendInput version was working, with the exact same input syntax (nearly a copy-paste profile), the result was a 100% working solution with the full set of emoticons from the gallery. SENDKEYS key(s)Request the server to send keyboard events to the currently focused application. SENDINPUT key(s)Same as SENDKEYS as hardware macro key events. SENDINPUTTEXTLike SENDINPUT but using the text attribute content. SERVERThis tag text will be replaced with the current server Id, IP and MAC addresses. Some tabs are just comments when they have a tag=# ... specifying a null-effect command. But those have their own usefulness when the tab's text attibute (what is displayed) contains a wall of text that cannot fit into a limited space. When you click on one, it turns full-screen showing the full content. Any button can be made full screen with a long-touch. This is the first step of the device-side editing process. A second long-touch would open the text and tag editor. The best way to illustrate how this can be helpful is by inserting some Profile loading buttons to navigate from one profile to another related one. A few screens with less buttons will be easier to use and organize than a single larger one containing all of them. Both may be used as long as you can zoom, pan and scroll but it's even easier not having to. 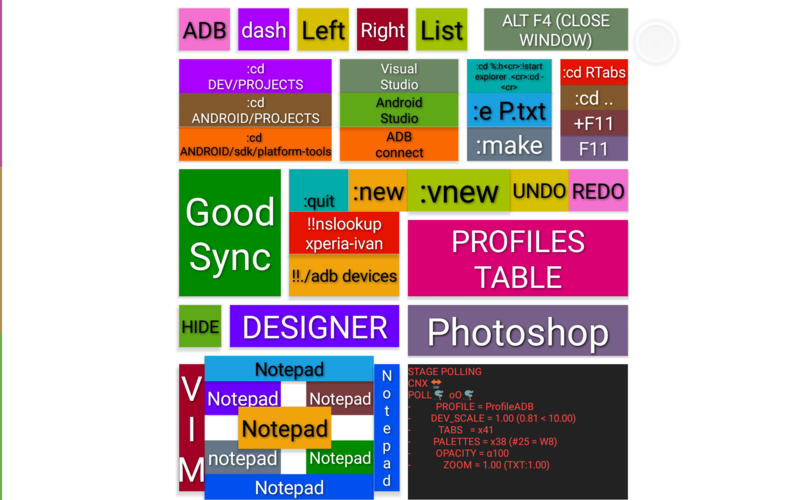 RTabs design can be as simple as using one of the available WORKBENCH templates from the Android device, filling in the blanck tabs with URLs to browse or PC commands to send. 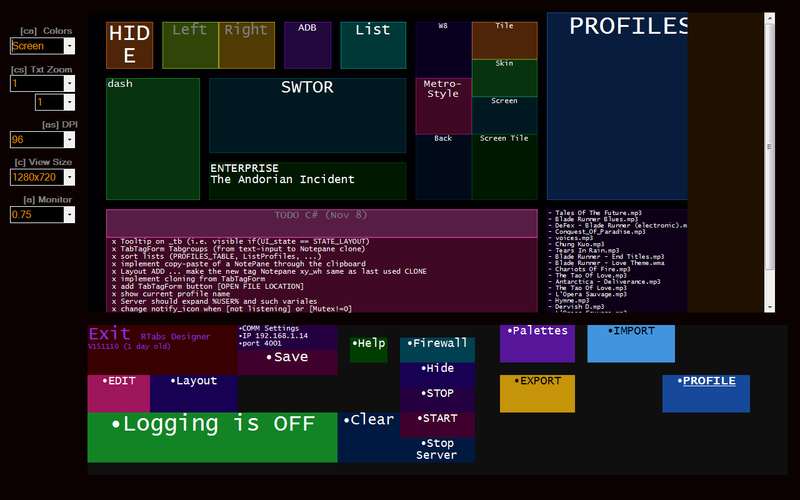 But it also can be as sophisticated as we want when building a custom control dashboards. That's where a more elaborate processing can help when working on dozens or even hundreds of tabs. RTabs PROFILES are simple Text files you can open and manipulate as if they were simple lists of items you can play with. The Android device and PC Server automatically synchronize those files when (if) you setup a WiFi connection (based on their date of last modification). If needed, their content follow a few rules that should easily make sense to anyone curious enough to think about how we can specify web adresses, PC commands, rectangles and colors. There is nothing more to it and these rules are not really an issue as long as we can specify these values one way or another. There should be one for each of the Android App, the Server and the Designer. Some smart auto zoom and recentering on tab-groups when one of its button is activated. …and here come yours, when you have a hunch about something that could be fun trying! With what is already there, it could be that something seemingly complicated could be working more quicly than expected. RTabs app on Google Play has a link in its READ MORE page for those interested by a free download link. Strangely enough, it is not possible to organize a free access to paid apps during their test stage… It looks like this is considered necessary by the administrative staff in order to avoid some kind of security risks. Anyway, this won't be a problem as long as you can install the required files from this site. So, as I don't want to disappoint anyone this soon, you should rather get the free test apps… directly from the remotetabs.com links listed in the Download and Install section below. Download and install the apk (built for KitKat, Lollipop or Marshmallow), Depending on the Android version/API level of your phone or tablet , there may be a few marginal differences. Download and install the windows/RTabs.zip archive containing RTabsServer.exe, RTabsDesigner.exe and a few Profiles.txt files. These can be unzipped into the user folder created by the desginer at first launch but the last apk version has them embedded already and they should seamlessly propagate up to the Server at first use when connected. How-tos are still missing! 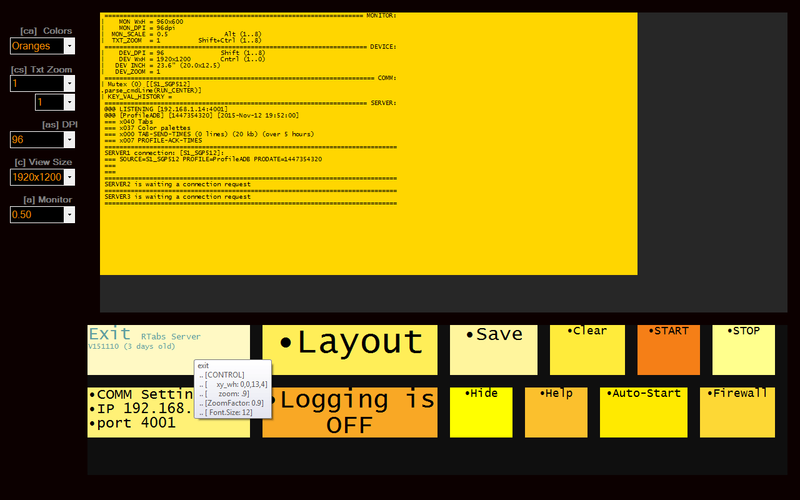 … I have so much to explain about how to operate each window, button, keyboard and mouse click and double click! In the meantime, you can activate all these functions with a double-click on any part of the Designer GUI backgrounds and buttons hitting one of the ESCAPE, DELETE plus F6 and F7 with any combination of ALT, SHIFT and CONTROL modifiers I plan to document all this shortly along with the required FAQ. Anyway, those functions will be adjusted based on the feedback I get from testers. As you should not pay for an immature piece of software, those are free versions that will be available as long as some issues may still disrupt user experience. The Microsoft installer version has been tried but it was quite overkill for theses two apps! As these are really lightweight ones, due to the custom RTabs dynamic construct that there is absolutely no need for the database involvement of the System "Add Remove Program" policy. There is only two apps, less than 1Mb for the both of them! You can install them anywhere you want. If you keep them together, the Designer can start the server for you if you forgot, that's all there is to it.